There's so much to love about the Amish Eclipse Parsons Chair. A parson chair style, the Eclipse is versatile and elegant, blending seamlessly with your dining room or kitchen decor throughout any changes. The Eclipse has a long, slender, elegant chair back that is no fuss yet full of decoration. The back has some flex in it and both the back and seat are soft and comfortable. These dining chairs are ready to host everything from breakfasts to banquets in your dining room. The simple design of this dining room chair makes it a go to for many occasions. You select from several wood options as well as fabric or leather options. Every chair made at DutchCrafters is Amish made with a long-standing quality you can count on. You can count on a dining chair like the Eclipse to always look elegant while offering the padded comfort you're wishing for. 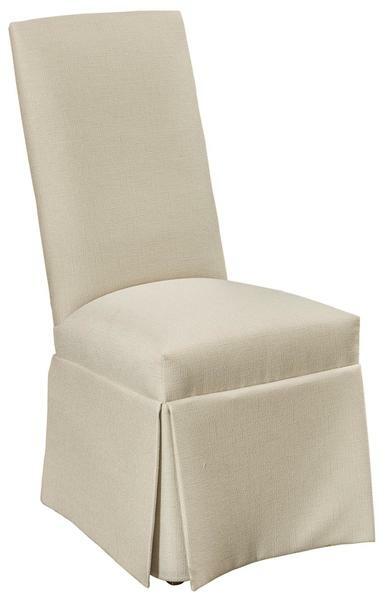 These side dining chairs bring beauty to your dining room or are great candidates for a hotel or restaurant. View our complete collection of dining chairs and enjoy all the variety we have to offer. Please call today to speak with an Amish Furniture Specialist about our custom made dining chairs. The call is toll-free at 866-272-6773. Shown in Brown Maple Wood with Golden Brown Stain.Seat Shown in C8-14 Fabric.